Home / Historian / Stories of Bromley Lost Memorials are now online! Stories of Bromley Lost Memorials are now online! 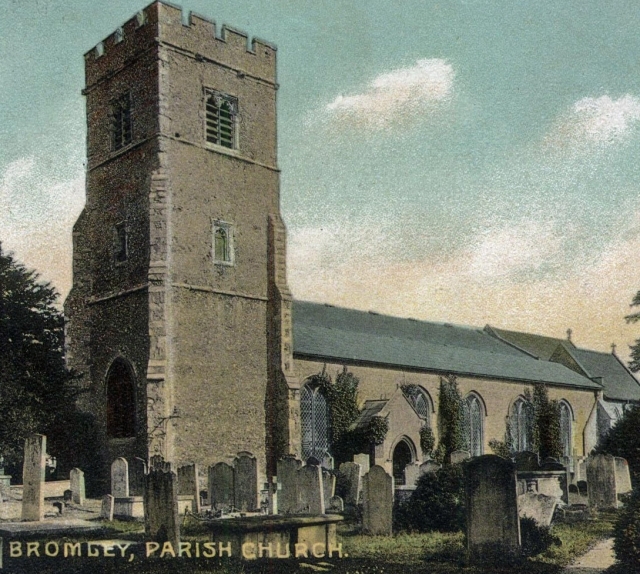 Records of thousands of people who lived in Bromley and district over a period of many centuries are now featured on the Kent Archaeological Society's website. The records, in the form of memorial inscriptions (‘MIs') on gravestones, tombs and monuments at the parish church of St Peter and St Paul, Bromley, were noted by an anonymous antiquarian who visited the church in 1829 and by Richard Holworthy, a former Kent County Council archivist, who transcribed the inscriptions about 90 years ago. Since then many of the memorials have been lost, rendered illegible, or were destroyed when the medieval church, within which there were about 100 monuments, was bombed in an air raid on April 16, 1941. Only the tower survived. Fortunately Holworthy's transcriptions were published in The British Archivist in 1915, a copy of which survived among the papers that Leland Lewis Duncan of Lewisham, antiquarian and author, left to the Kent Archaeological Society when he died in 1923. Until now the transcriptions could be read only by those able to visit the KAS library in Maidstone, but all of them are now online and accessible free of charge. * Elizabeth (‘Tetty') Johnson, (‘beautiful, elegant, talented, dutiful'), wife of Dr Samuel Johnson, the lexicographer and essayist. She died in 1752 although her gravestone bore the date 1753. *Mary Ann Gayton, the schoolmistress who taught William Ewart Gladstone to read. * Thomas Chase, who survived the Lisbon earthquake, tsunami and great fire of 1755 in which 90,000 people died. He was buried in the ruins of house where he was born in 1729 and ‘by Degrees recover'd from a very deplorable condition'. *William Ledger, ‘robbed on earth by pretended friends/now beyond their power and sphere/As thieves and robbers cannot enter there'. *Martine French, who was buried with four of his wives and two daughters. He died on January 12, 1661. His last wife died the following day. *Thomas West and his wife Elizabeth, whose MI provides details of nine related families: Glenring, Hyde, Keysen, Lawson, Luard, Nicholls, Seymour, Vokins and Wollaston. *Bishop Zachary Pearce , who died on June 29, 1774 ‘in a comfortable hope of being promoted to a happier place in Heaven, what was the chief aim of all his labours upon earth'. The memorials to ‘Tetty' Johnson and Bishop Pearce were salvaged from the bombed church and re-erected in the new one. The names and performances of some of the church's bellringers are also recorded. In 1774 the ‘Youths of Bromley' rang a half quarter peal of ‘Bob Major' (5,050 changes), to celebrate the recasting of the bells. In January 1817 the Society of Bromley Youths rang a complete peal of Grandsire Triples (5,040 changes) with muffled bells, in memory of William Chapman, a ringer in Bromley for 43 years, and rang ‘upwards of 60 peals - ‘the first Dumb Peal of this kind ever Rang in this Kingdom'. In 1902 The Kent County Association of Change Ringers rang Gabriel Lindoff's peal of Kent treble Bob Major (5,088 changes) to mark the rehanging of the bells. In 1904 members of the KCACR rang a peal of Grandsire Triples (5,040 changes) with muffled bells, at the funeral of Rev. Arthur Gresley Hellicar, curate and then vicar of Bromley for 43 years. To view the MIs visit Kent Arch Research , then click on Bromley in the ‘Churchyards MIs' list in ‘Library & Visual Records'.